This is a massive undertaking and I hope I do it justice, but I would like to talk about the key differences between the ratings of the Marvel television shows and the DC television shows. Just to be clear, I am only talking about the shows that are canonical with the current universe that the shows are based in (THE MCU and the ARROWVERSE). Therefore I will not be including Gotham as to the best of my knowledge, it is not apart of the Arrowverse. First of all, I think it would be a good idea to discuss the best and worst of both universes. If we were to start with the worst, I bet most people would be able to predict what there were, so lets. Inhumans (Marvel) is on the left and Supergirl (DC) is on the right. Now as you can clearly see, we don't learn much from the Inhumans graph, and we probably never will as it is either already cancelled or is likely to be. What we can gain information from is the hard facts, that the average episode rating of the Inhumans is 6.7. This pales in comparison to Supergirl, which has an average rating of 8.1. Now of course if we have a look at the start of both graphs, we can see that both shows come from humble beginnings, but the lowest rating for Supergirl is 7.3, whilst Inhumans is a staggering 6.4. 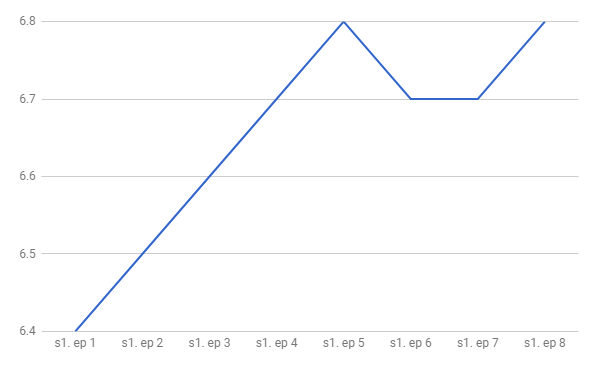 Even though this isn't the lowest episode rating, or even the first episode rating that I have come across, it is still very low and what is even more remarkable is that there was no recovery from it. Now, this is probably the biggest key difference between the two shows; Inhumans was produced in one go, before the first episode was released, whilst Supergirl had about a 4 episode buffer, giving them time to correct course and change fundamentals which intern effected the outcome of the viewer feedback. Daredevil is on the left and The Flash is on the right. Firstly, I would like to admit that the difference between The Flash and Arrow is minimal, but The Flash does beat it's average episode rating, which is 8.6. However, it doesn't beat Daredevil's impressive 9.0, which despite it only having 26 episodes compared to The Flash's 92, it is still remarkable considering how damaged the IP was before the show aired. Another thing that Daredevil beats The Flash in is consistency. 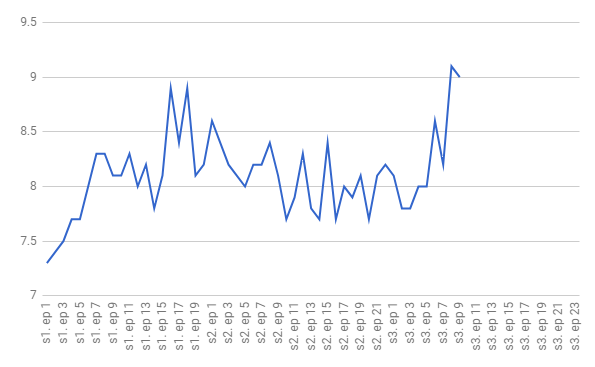 As you can probably tell without looking too far past the graphs is that Daredevil just gets more consistent reviews. 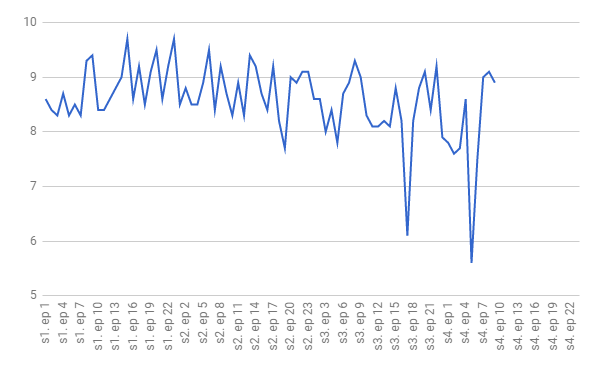 Now this could be down to the fact that most people are watching multiple episodes at once because it is on Netflix, or just because the story is less congested and situational than The Flash, but the main thing that we can tell from the data is that it Daredevil is much more consistent than The Flash. This is especially true with the fourth season of The Flash, which has dropped of remarkable, having the lowest rated episode to date with a 5.6. 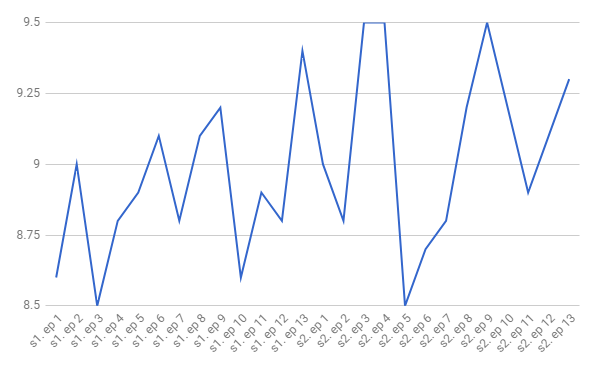 However, being situational and being able to adapt might be better for a show in some cases as the highest rated Daredevil episode (9.5) is beat on multiple occasions by The Flash, but does that make the inconsistency worth it? This raises another topic or conversation, how does binge watching or designing a show to be binge watched effect its quality and consistency? Something I will probably cover another time. Also just a little factoid that doesn't particularly take part in this argument. If we include Inhumans as a cancelled show, then Marvel's cancelled shows rings up to 2 with Agent Carter and Inhumans, whilst DC's is 1 with Constantine. Because the best and worst of both universes have their merits, I think it would be best to decide which TV universe is better by tallying the average show rating (not episode rating) of each universe. Also just as a little footnote, I also discovered that Marvel have two shows that are worse than Supergirl with Iron Fist being rated at 7.8.